This is the fifth volume in Sofawolf Press' Artistic Visions series of art-sketch format albums. The first four each showcase one (or two) of the best artists in furry fandom; Kenket (Tess Garman), Brian and Tracy Reynolds, Ursula Vernon and Henrieke Goorhuis. Each is a professional artist, but is especially well-known in furry fandom for convention conbook covers, badge art and other commissioned art, and trades with other Furry artists; many of which are posted on DeviantART, FurAffinity and other art websites. Hibbary (Hillary Leutkemeyer) has been a member of DeviantART for over a decade, and she was Artist Guest of Honor at Furry Weekend Atlanta 2013, but otherwise she is little known in furry fandom. This large (8½” x 11”) volume of Artistic Visions should change that. St. Paul, MN, Sofawolf Press, July 2014, trade paperback $14.95 (99 pages). 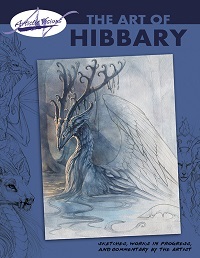 Where Hibbardy’s graphic design and painting differs from that of the previous Artistic Visions artists is that her art is more “realistic”, even in drawing dragons, chimeras (which she calls khimeras) including human-headed animals and anthropomorphic animals. 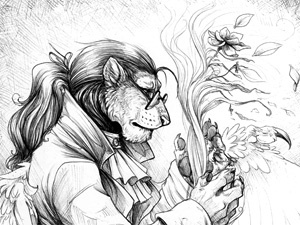 Her art demonstrates that she does excellent paintings of anthropomorphic animals for furry commissions (page 7), but that what she doodles and does quick thumbnail sketches of for her own pleasure are not “cartoony” figures but what dragons and anthropomorphized animals would look like if they are realistic. 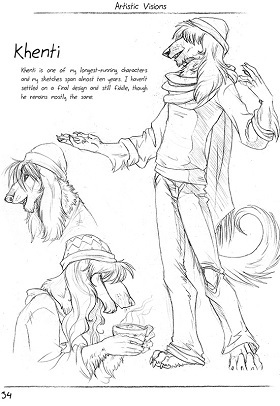 Khenti appears to be an anthropomorphized Afghan hound beat poet or street busker. Hibbardy has been active on a website, khimeros.com, devoted to a world of fantasy animals, mostly mixtures of two species. In addition to the creatures, she helped design banners, architecture, and other aspects of this world. Of course, she can draw cute ‘n cartoony when the occasion demands. Artistic Visions takes you into a popular furry artist’s mind and working style. There is advice here on how to draw, where to get ideas, how to get commissions and how to finish them, and bad artistic habits to avoid – at least, what Hibbary has learned over the years. Fans of fantasy art will find this fascinating. Flayrah covered his death pretty thoroughly. One of the things that it reported was that the police did not arrest the driver (though they gave her a ticket) who caused McCormick’s death, because they determined that she was not drunk, both had been speeding but McCormick was going faster and not on a medical emergency, and neither of the EMTs were wearing a seat belt (which I believe was legally required – it is in California, anyway). Which is correct? I believe WikiFur is wrong here; I think even our original article said "drunk driver" but that apparently was a rumor. We corrected, but somebody forgot to update an apparently unrelated article on WikiFur. Lemonade Coyote's accident happened in Indianapolis, Indiana. Were you perhaps thinking of Furp (whose fatal accident was in California)? In both cases, the driver of the other had some alcohol but less than the legal limit, yet some jumped to the conclusion that it was a drunk driver. Edit: Somehow I misread the reply to be saying that he thought Lemonade Coyote had died in California. Sorry, my mistake. It's nice to see this book series being revived recently. This is the actually the sixth volume – the first was the now out of print "Art of Herbie" published in July 2003.